The Election Commission wrote to the Telugu Desam Party asking how a person with criminal antecedents could be a part of a delegation led by its chief N Chandrababu Naidu during his Delhi visit. 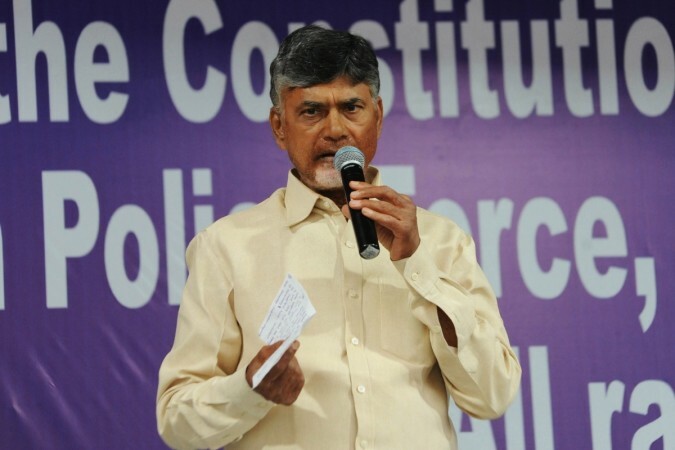 The war of words between Andhra Pradesh Chief Minister N Chandrababu Naidu's party and the Election Commission continued after Naidu alleged that 30 to 40 percent of voting machines in his state did not work properly on April 11, the first day of the national election. Demanding a re-poll in nearly 150 polling, Naidu flew down to Delhi with his delegation to meet officials of the Election Commission. However, the Election Commission wrote to the Telugu Desam Party asking how a person with criminal antecedents could be a part of a delegation led by its chief N Chandrababu Naidu during his visit to the poll panel on Saturday. The EC in its letter has said when Naidu visited, he was accompanied by one Hari Prasad who repeatedly raised various technical issues regarding the functioning of EVMs and claimed that he had the technical expertise in the field. The letter stated that it was decided that Prasad would get a detailed briefing from the technical team of the EC. "However, when this technical person came, it turned out that he was Hari Prasad who was involved in a criminal case regarding alleged theft of EVM machine in 2010 which an FIR was filed ... Whatever may be the eventual outcome of the investigation, it would be appreciated that such antecedents do not inspire confidence." "This is completely intriguing as to how a so-called technical expert with these antecedents was allowed to be part of the delegation led by N Chandrababu Naidu, Chief Minister of Andhra Pradesh and President, TDP," the letter from EC, addressed to the president of the party's legal cell, said, as reported by a news agency. The TDP, in its reply, said no charge sheet was filed against Hari Prasad Vemuru in the last nine years and claimed that he is the first Indian to be honoured with the US-based Electronic Frontier Foundation Pioneer Award nine years ago. The party hit back at the Election Commission and said, "...instead of focusing on the issue, the commission is trying to avoid addressing the situation." The TDP said, the commission should, instead, "comprehend, clarify and resolve the issues raised by Mr Hari Prasad Vemuru on our behalf". The Andhra Pradesh chief minister met Chief Election Commissioner Sunil Arora in the national capital today and submitted a memorandum alleging that a large number of EVMs malfunctioned during polling in the state on Thursday and inadequate security led to incidents of violence. Voting took place for all the 25 parliamentary seats in Andhra Pradesh and for its 175 assembly seats on April 11, with results to be declared on May 23.